I'm not a huge tahini fan. There, I said it. Yes this is my second recipe this year using tahini for flavor not including hummus, no I'm not on the bandwagon. Okay, maybe I am. Shoot, I'm on the bandwagon. Okay okay hear me out. I don't like tahini right off the spoon like I would a peanut or nut butter, it's just way too bitter to be enjoyed this way. But the nutty depth tahini adds to a dish is undeniably satisfying. 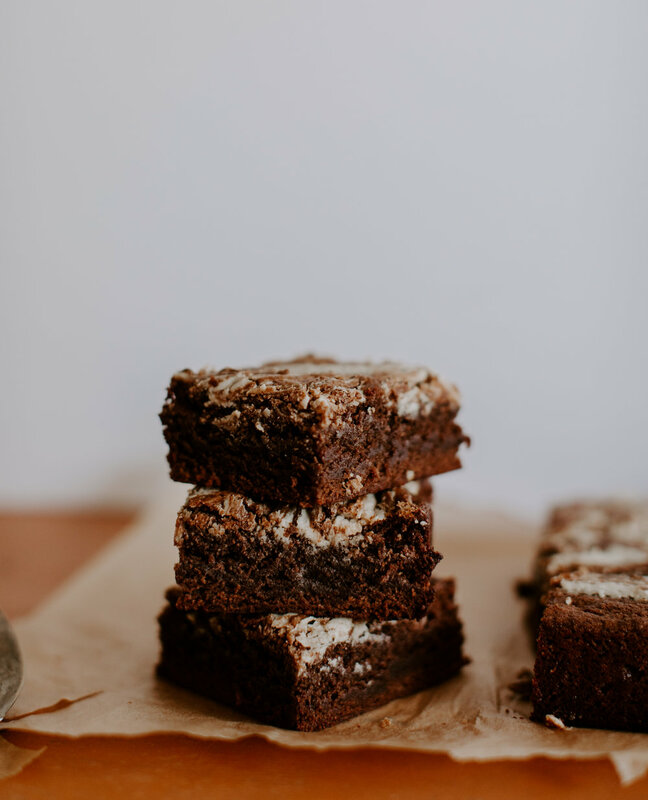 So when I went to make these classic brownies the other day, I felt inspired to kick them up a notch and to explore more of this flavor that has me so torn. I knew that the tahini alone would be way too intense for the super sweet, already slightly bitter, iconic brownie. So I sweetened the tahini using the oh-so-delicate powdered sugar in hopes that it would take the edge off the bitterness. The results were good. Like really good. Just as I suspected, once I cut out the sharpness of the tahini, the earthy flavors were able to present themselves quite nicely with the brownie. But really, at the end of the day my favorite thing about this recipe is that it is still super duper easy, but feels special. If tahini is totally not your thing, you don't have it in your house, and you're not planning on making a hummus, like ever, ever... then feel free to use your favorite nut or seed butter in it's place. If you're doing peanut butter, I'd probably only add the milk and a tiny bit of the powdered sugar, you don't need a ton of sweetness there. Another option would be a sunflower seed butter. Trader Joe's has one that I really love and I bet it would be the closest to tahini in terms of flavor profile. A classic brownie recipe with a twist. The sweetened tahini adds all the nutty/earthy flavor but without any of the tahini's bitterness. Preheat oven to 350. In a mixing bowl using either a standing or hand-held mixer, cream together the butter, cocoa, and sugar, about 3 minutes. Once the sugar mixture has lightened in color and is a bit fluffy, add the eggs one at a time, mixing slowly until you no longer see the yolk before adding the next egg. Add vanilla, mix, and scrape the bottom of the bowl to make sure everything has been mixed well. In one addition, add flour and salt (mixed together in a different bowl) to the sugar and egg mixture. Mix on slow until brownie batter has formed, roughly 2 minutes. Pour brownie batter into prepared pan, and using a wet spatula spread mixture into each corner and set aside. In a small bowl, use a whisk together tahini, powdered sugar, and milk. This mixture should be slightly thick but spreadable-able. Pour tahini mixture over brownie batter in a grid pattern. Using a fork swirl the tahini around making fluid motions and pushing some tahini deeper down into the brownie batter. Bake for 30-40 minutes, or until center is cooked (test with a toothpick).